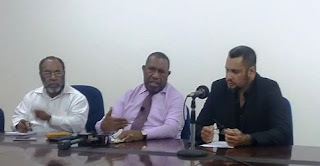 The Chairman of the Special Parliamentary Committee on Public Sector Reform and Service Delivery and Member for Goroka Bire Kimisopa has departed from protocol by releasing three reports following numerous attempts by the Special Parliamentary Committee to have the reports tabled in Parliament. Flanked by Deputy Chairman of the Special Parliamentary Committee Governor for Oro Gary Juffa, the 3 reports revealed findings on the late delivery of teacher leave fares in 2013, an interim report on Health sector Management and a final report on Health sector Management. With the current issue on the rise of Multi Drug Resistant TB (MDRTB) in PNG, a report into Mabudawan Health Centre in Daru showed findings of no BCG Vaccine to protect children from TB, no funds for rural visits to administer BCG Vaccine, No effective protection for medial staff treating MDRTB and no follow up of TB patients leading to rise of MDRTB. To add to this the funds are yet to be provided for the Stage 1 program as per the NEC decision on the K1.8 million for TB. As rural health centres face its challenges the Cancer treatment facility with its lack of cobalt to treat cancer patients in Lae persists adding to lives that can be saved lost, this and other issues in the Health Sector drove the Parliamentary Committee to set about preparing an interim report on Health Sector Management highlighting an excess of managerial problems that needs to be addressed as a matter of urgency.